Contemporary observers often quip that the American Southwest has become “Mexicanized,” but this view ignores the history of the region as well as the social reality. Mexican people and their culture have been continuously present in the territory for the past four hundred years, and Mexican Americans were actors in United States history long before the national media began to focus on them—even long before an international border existed between the United States and Mexico. 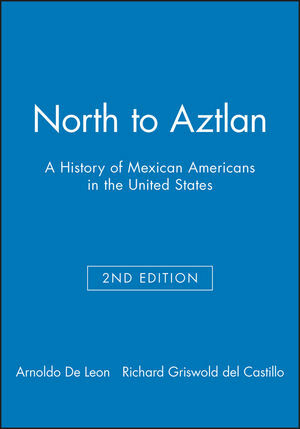 North to Aztlán, an inclusive, readable, and affordable survey history, explores the Indian roots, culture, society, lifestyles, politics, and art of Mexican Americans and the contributions of the people to and their influence on American history and the mainstream culture. Though cognizant of changing interpretations that divide scholars, Drs. De León and Griswold del Castillo provide a holistic vision of the development of Mexican American society, one that attributes great importance to immigration (before and after 1900) and the ongoing influence of new arrivals on the evolving identity of Mexican Americans. Also showcased is the role of gender in shaping the cultural and political history of La Raza, as exemplified by the stories of outstanding Mexicana and Chicana leaders as well as those of largely unsung female heros, among them ranch and business owners and managers, labor leaders, community activists, and artists and writers. In short, readers will come away from this extensively revised and completely up-to-date second edition with a new understanding of the lives of a people who currently compose the largest minority in the nation. Completely revised, re-edited, and redesigned, featuring a great many new photographs and maps, North to Aztlán is certain to take its rightful place as the best college-level survey text of Americans of Mexican descent on the market today. Arnoldo De León is C.J. “Red” Davidson Professor of History at Angelo State University in San Angelo, Texas, where he has taught since 1973. He is the author of several works on Texas history and Mexican American history, among them The Tejano Community, 1836—1900 (1982, 1997); They Called Them Greasers: Anglo Attitudes Toward Mexicans in Texas, 1821—1900 (1983); Ethnicity in the Sunbelt: A History of Mexican Americans in Houston, Texas (1989, 2001); Racial Frontiers: Africans, Chinese, and Mexicans in Western America, 1848—1890 (2002); and Tejano Epic: Essays in Honor of Felix D. Almaráz Jr. (2005). His numerous awards and distinctions include selection as Fellow of the Texas State Historical Association and membership in the Texas Institute of Letters. He is married and has six children and seven grand children.